Ryan's Smashing Life: Dark Was The Night! PICK IT UP - ROCK FOR A CAUSE: Musicians are working together these days performing some pretty sensational songs for Dark Was The Night a new benefit albums for the Red Hot organization (an international charity dedicated to raising money and awareness for HIV and AIDS through popular culture). The latest compilation (a double CD) was produced by Bryan and Aaron Dessner from the National. This one offers up all new, original songs from some seriously hefty talent (see below) and it goes on sale on Tuesday. Never has doing the right thing sounded so good! The evening kicks off at 8pm, and is brought to you by Red Hot, 4AD, Insound, River Gods, Dewar's, and of course, Bradley's Almanac. 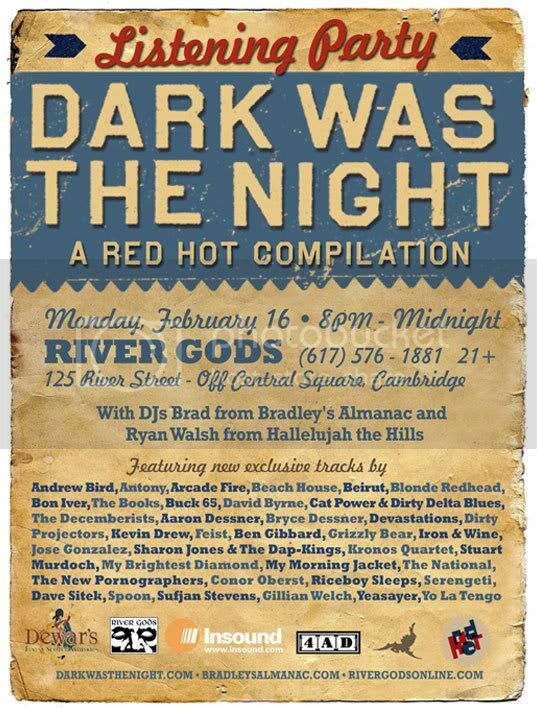 River Gods is located at 125 Cambridge St., in Cambridge, MA, near Central Square. The Facebook event page for the listening party is here, and to preview some songs from the compilation, head here. The listening party will include giveaways (several copies of the two-disc compilation, along with some surprise musical goodies, and even some complimentary beverages), and guest DJ Ryan Walsh from Boston-based band Hallelujah the Hills, who will join me in selecting songs to play before and after the album itself. And in the spirit of the occasion, we'll also be collecting donations for the Boston Living Center, an area HIV/AIDS assistance program, so bring a few extra dollars for the jar if you can spare them.